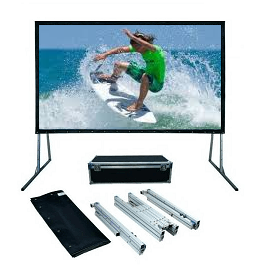 This fast-fold portable rear projection screen is perfect for indoor or outdoor use for groups of around 50 people. The 16:10 wide format is designed to to be used for a combination of presentations and video. The FF series are our most advanced fast-fold screen. The FF series range features commercial grade flexible screen surfaces with press-studs, a quality height-adjustable frame with fly-points and an improved road case. The flexible surface is designed to be folded and stretched. 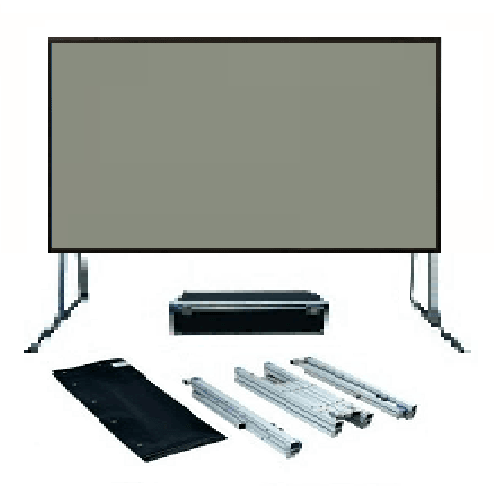 This ensures a taught, flat projection screen surface for a better viewing experience. This screen comes with a grey rear projection surface. The FF series frame is based upon the latest click-frame system for a strong and durable frame which is easily assembled. The 3.2cm tube alloy frame also comes with sturdy,removable legs. If legs are not required the screen may be suspended using ring-bolts attached to fly-points in the frame. The FF Series is designed to be portable and comes with a quality road case. Screen surface (viewable area including 5cm border) area is 400cms by 250cms. The Screen weighs approximately 55kgs. 186" size refers to the diagonal of the screen surface expressed in inches. The screen surface included is a Rear Projection flexible grey translucent surface. The Screen surface is attached to the screen with press-studs. The frame is a metal alloy with a square profile and measures 3.2cms by 3.2cms. Fly-points are incorporated into the frame. The legs are a square profile metal alloy and height adjustable. The road case is made from aluminium alloy.